Orange County, Fla. – The Orange County Utilities Solid Waste Division will begin weekly large item curbside collection starting New Year’s Day, Monday, January 1, 2018. All curbside collection customers will be able to leave large items by the curb without scheduling an appointment throughout the year. The designated large item day will be the same as yard waste for customers of unincorporated Orange County. Residents can verify their curbside collection at www.ocfl.net/CollectionSchedule. Monday, January 1, 2018, is not a collection holiday. Therefore, curbside service WILL occur on that day for Monday yard waste routes. Customers are reminded to set out items prior to 6 a.m. and to keep large items separated from yard waste because each are picked up by different crews. The weekly limit will remain three cubic yards or about the size of a small pickup truckload. Items include furniture, mattresses, up to four tires, TVs and appliances excluding Freon-containing devices such as refrigerators and freezers. The only two holidays for curbside collection of garbage, recycling, yard waste and large items are Thanksgiving and Christmas days, but crews work Saturday during those holiday weeks. For any questions, please contact the Orange County Utilities Solid Waste Hotline at 407-836-6601 or email Solid.Waste@ocfl.net, which will resume business on Tuesday, January 2. 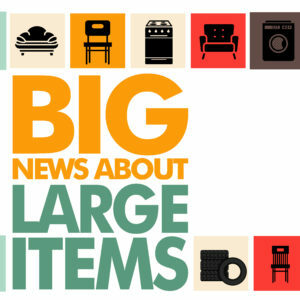 Visit www.ocfl.net/GreenClean for more large item information.